When I was growing up my parents would never let me have a cat. My dad claimed to be allergic and my mom just didn't like them. When I finally moved out on my own I decided I wanted a friend to come home to. 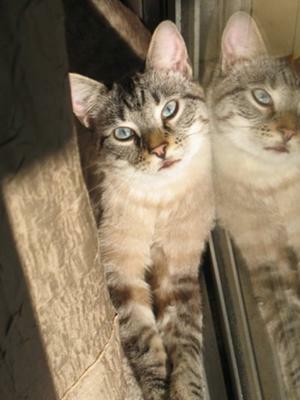 I found Leo online, claimed to be a Himalayan mix, and, also, a girl. Turns out both of those assumptions were wrong. When I brought him home I realized he had the Siamese points and the vet discovered 'she' was really a boy! Leo was a new adventure since I had never lived with a cat. We watched movies together and he would talk to me all the time. 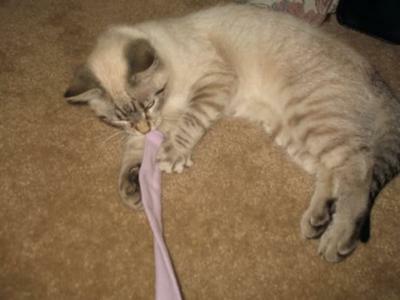 Eventually I found out from a friend that he was a Lynx Point Siamese. About a year after Leo came to live with me he started getting sick. I didn't think anything of it at first because I thought maybe he ate something bad. But when it started to happen after every meal and every treat I knew something was wrong. I took him to the vet within a couple of days and they did an x-ray. They didn't see anything wrong but decided to keep him overnight. The next day they called and said he was still sick and asked if they could do surgery as his risk of dying was very high. He wasn't eating or drinking anything. It turned out that he had an inflamed pancreas and hemorrhages in his intestines due to Inflammatory Bowel Disease. Luckily Leo was placed on a special diet which helped with his stomach issues. I switched him to an all-natural high fat/high protein diet. It was a costly decision but he's a part of my family now. He's back to his playful self and has been teaching his new friend Scootter all his mischievous ways! What a beautiful boy! Thank you Jessica for telling us about Leo and sharing your pictures. He's a lovely Lynx Point Siamese. How upsetting for you to have gone through all that worry with Leo's Inflammatory Bowel Disease - it's always so distressing when our cats are sick. Changing a cat's diet is the right way to go but, as you say, special food can be expensive. I'm really pleased for you that the vet was able to find out what was wrong and put Leo on the road to health again, and that he's back to his normal bouncy self. What makes a Siamese cat a Siamese cat?